to transform the dust into a garden. To bid the wings of soul to fly. The sea becomes filled with pearls. The dry land receives the water of life. who we should be to the people around us. and to close our hearts to love. Love not only for others but for ourselves. MOVEMENT TAKES YOU BACK TO LOVE. In this retreat, you will explore ways to experience love in the body. Suz Mendoza is a Qoya teacher who teaches in the Gold Coast, Sydney, and Hong Kong. She has trained, shared, and cultivated her practices throughout the US, India, Asia and Australia. She first studied Qoya in Kauai, Hawaii, and recently completed her certification with Rochelle in Woodstock, New York. She is in love with love and truth - knowing your truth, embodying your truth, expressing your truth, and trusting the voice of truth always. Read more at www.qoya.love/suz-mendoza. 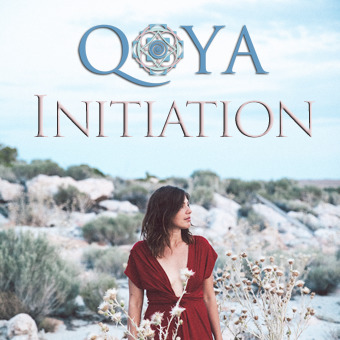 Qoya Initiation Teacher Training will be offered on February 23rd before the retreat begins at an additional cost of $1,085 AUD to cover the course tuition and extra night's accommodation and meals. If you have offsite accommodation or live in the area, you can enroll for $600 AUD. If you wish to join us, simply check Yes on the registration form below, selecting the training either with or without accommodation. Click here to learn more about Qoya Teacher Training. Note: you must complete the Intro to Qoya online training before the Initiation Training in order to participate. While the official retreat will end on February 26th, you can stay on through February 28th for an additional Integration Day - time to relax, journal, spend time in nature, take another relaxing Qoya class, and have some less structured time to nurture yourself before returning home. The cost is an additional $300. If you wish to add this on, simply check Yes on the registration form below. 2pm-6pm: Afternoon massage, beach excursion, hike, swim, or relax! 12pm-1pm: Lovely Lunch and blessings for your next adventure! The cost of the training is $600 if you have housing elsewhere, and if you need to stay onsite, the cost is $1,085 to cover your nights' stay on February 23rd and meals. You can stay on the exquisite property for 2 extra nights after the retreat has ended for an additional $300 total. This will include free time to yourself as well as a Qoya class and rituals led by Suz. 1pm-6pm: Integration Time Begins! Afternoon massage, waterfall excursion, hiking, swimming, relaxing. 10am–1pm: Blessings for your next adventure! The retreat will be held at a beautiful private residence in Byron Bay, Australia. It is 25 minutes from the beaches, next door to the largest waterfalls in NSW, and minutes from Crystal Castle - sublime. The accommodations here are luxury glamping spaces sprawled through the orchards, complete with lounges! Imagine this: a private property in Byron hinterland. You are immersed in nature, utterly relaxed and peaceful on 120 acres of secluded paradise. You rest on sacred land complete with its own crystal bed creeks (the same creek that flows on from energy and water upstream where blessed Dalai Lama monks play), a stunning nature reserve, acres of gullies with delightful springs to swim in, a vortex tree, hours of hiking trails, koalas, hundreds of butterflies, an infinity pool, mango trees, a citrus orchard, swimming holes with turtles, soft breezes, and sweet sounds of rustling eucalyptus tree leaves and birdsong from over 60 species of birds. At night after an organic, vegetarian meal made with love by a private chef, you'll sit with your sisters in ceremony by a fire pit under the expansive Australian night sky. Twinkling fairy lights will lead you back to bed you through rows of macadamia trees. Access to our stunning property – including guides for hiking, creeks and springs to swim in, orchards, infinity pool, vortex trees, sacred meditation portals and beyond! Complete the form below, and Suz will contact you to make payment arrangements. Add on Post-Retreat Integration Time through February 29th? Thank you for submitting your registration! Suz will be in touch soon. If you need to cancel for any reason and we can find a person to take your spot, we will refund the amount paid minus a $300 non-refundable deposit. If we cannot find a person to take your spot there are no refunds; however, you can transfer your paid spot to someone else, so you can send a friend or family member to the retreat in your place. Please plan to arrive between 3-6pm on the 24th and plan to leave the property by 1pm on the 26th (or 1pm on the 28th if you're staying for the Integration Day). On confirmation of your retreat payment, we will email you all details and directions to reach us. The closest airport is Ballina NSW airport, which is a 45 minute drive from the property. Gold Coast Airport is approximately 1 hour drive. You can arrange a shuttle/transfer from and to the airport (if there are a number of dancers arriving around the same time we can organise this for you) or we recommend hiring a car if you’d further like to explore the area and beaches during your free time. + Do I need to hire a car? If you’d further like to explore the area and beaches during free time, we recommend you do. This is a women only retreat for women ages 18 and up. There are no levels in Qoya, and all levels of movement experience are welcome. No experience with Qoya is required! The menu at the retreat will be created by our own private chef who will provide three delicious vegetarian meals a day. We will cater for any dietary requirements provided you let us know when booking. Please feel free to bring any special/extra snacks, etc. you desire.